Many mortgage companies are reluctant to give strapped homeowners a break because the companies collect lucrative fees on delinquent loans. Even when borrowers stop paying, mortgage companies that service the loans collect fees out of the proceeds when homes are ultimately sold in foreclosure. So the longer borrowers remain delinquent, the greater the opportunities for these mortgage companies to extract revenue — fees for insurance, appraisals, title searches and legal services. Politicians might make a lot of noise about how banks and mortgage lenders aren't doing enough to help out distressed borrowers, but there is a good reason why. Government initiatives to stem the country's mounting foreclosures are hampered because banks and other lenders in many cases have more financial incentive to let borrowers lose their homes than to work out settlements, some economists have concluded. Policymakers often say it's a good deal for lenders to cut borrowers a break on mortgage payments to keep them in their homes. But, according to researchers and industry experts, foreclosing can be more profitable. One in 84 is 1.2% of all homeowners in the United States just were foreclosed on in just a 6 month period! The number of loan modifications significantly increased. During the quarter, servicers implemented 185,156 new loan modifications, up 55 percent from the previous quarter and 172 percent from the first quarter of 2008. 12% of all mortgages behind in payments - what is behind these numbers? By now you all saw the headlines, 12 pct. 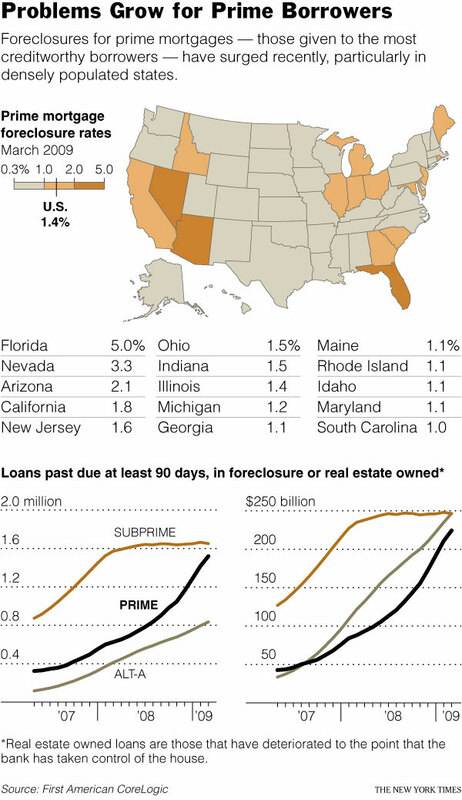 are behind on mortgage or in foreclosure, but what is behind these numbers? Firstly the foreclosures are expected to reach an all time high next year. Now people cannot pay their mortgage simply because they lost their jobs, businesses and income. Read more about 12% of all mortgages behind in payments - what is behind these numbers? You've probably already seen the headlines, Median Home Price down 14%, but what is behind the latest numbers? So, this latest drop is in just a 3 month period. But the regional differences are staggering. In Fort Myers Florida, prices are down 59.1%. Akron Ohio, down 48%. San Francisco and San Jose are down 42%. Miami Florida is down 35% and Los Angeles is down 34%. Much of this corresponds to foreclosure rates. The Mortgage Bankers Association released Delinquency data today and almost half of all subprime loans, in the United States are now past due. Subprime ARM loans and prime ARM loans, which include Alt-A and pay option ARMs, continue to dominate the delinquency numbers. Nationwide, 48 percent of subprime ARMs were at least one payment past due and in Florida over 60 percent of subprime ARMs were at least one payment past due. The overall delinquency rate is 7.88% by the end of Q4, 2008. This breaks the record of their delinquency data going back to 1972. If one includes the number of mortgages with one payment behind the percentages hit 11.93%. The Obama administration today released a plan to stem foreclosures. U.S. President Barack Obama pledged $275 billion to a program that includes cutting mortgage payments for as many as 9 million struggling homeowners and expanding the role of Fannie Mae and Freddie Mac in curbing foreclosures. The plan will help as many as 5 million homeowners refinance loans owned or guaranteed by Fannie and Freddie, the president said. Treasury will buy as much as $200 billion of preferred stock in the two mortgage companies, twice as much as previously promised, he said. Another "evolving plan". I think they will discover that there is no easy method for successful loan modifications (as FDIC Chairwoman Sheila Bair discovered when they took over IndyMac). I guess the plan is to buy down loans with the $50 billion - or pay a portion of the monthly payment. JPMorgan Chase and Citigroup Inc. announced plans Friday to temporarily halt foreclosures as the government works to finalize the details of a financial rescue package that could include billions of dollars in aid for struggling homeowners. Bear in mind this is just two banks and it is only a month. On top of things, there is no real plan in place to help those about to be foreclosed upon, never mind the ones who already were. This is a silver lining in a dark cloud, Freddie Mac and Fannie Mae are suspending all foreclosures until January 9th. Fannie Mae and Freddie Mac, the mortgage-finance companies seized by the U.S. government, are suspending foreclosures beginning next week through Jan. 9.